When it comes to Paper Mario, just about everyone will agree it’s declined over the last few years. With Super Paper Mario being a weird platformer/RPG hybrid and Sticker Star having no original characters, there have been lots of articles and videos about the death of the series and how Nintendo has screwed it over. How Miyamoto has ruined it based on surveys. How Paper Mario Color Splash is Sticker Star 2 and marks the final nail in the franchise’s coffin. But is all this negativity misguided? Are the calls to #MakePaperMarioGreatAgain a little premature? Well, I think so. In fact, I think Color Splash (and Paper Jam before it) are evidence that the series is actually returning to its roots, and that Miyamoto’s stranglehold on the series is gradually being loosened. Because when you think about it, there seems to be a slow but gradual return to the more original characters and settings as the game goes on. Think about it. 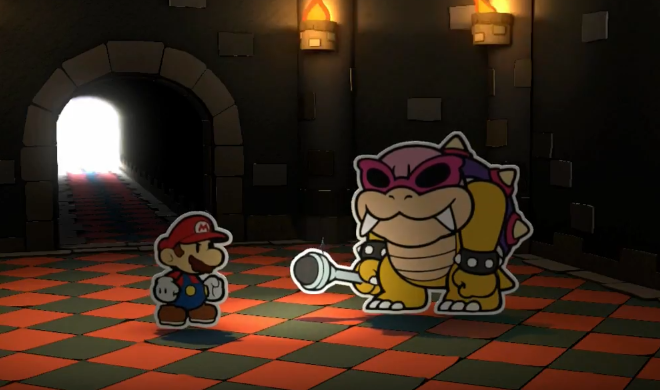 You’ve had Paper Mario Sticker Star, where all worlds were generic Mario stuff. You had grass land, desert land, forest land, ice land, Bowser’s Castle, etc. All very predictable, and with a few memorable exceptions (mostly in the ice world with the Enigmansion and boss), as generic and New Super Mario Bros like as you can get. Characters are all identical Toads, and bosses are 99% grunts with a fancy sticker crown on their heads. Then came Mario & Luigi Paper Jam. Yes, it’s a Mario & Luigi crossover more than a Paper Mario one, but still. It had areas with actual names and interesting themes, there were some more interesting things to do there (like the weirdly ghost antics in Gloomy Woods and the drill puzzle stuff in Mount Brrr) and it even had a few more ‘original’ areas too. Like the Twinsy Tropics Dungeon (Guantanamo Bay in a Mario game!). And heck, even the characters were a bit more interesting here. Like how King Boo, King Bob-omb and Nabbit all appeared with interesting, unique personalities. And when Color Splash came around, things arguably got a bit better still. Characters with new designs returned in a limited way (like the Rescue Squad, Rock Paper Wizard and the Paint Stars themselves). World themes actually got unique again, with a military base, Super Paper Mario like SMB 3 remix and circus being stand outs. And an RPG esque upgrade system that actually makes it more like the original Paper Mario games, not less. So on a content and character level, it’s improving. But that’s not the only thing that’s getting better, is it? Oh no, even the characters personalities are getting better in these games. Remember how generic Bowser was in Sticker Star? How he never spoke in the entire game and had zero personality? Well, in Paper Jam, he returned to his older Paper Mario personality, albeit with a slightly darker side. And in Color Splash, he’s again the comic relief. Same goes with Peach (who now has lines and something of a personality), the Toads and everyone else in the game. With each Paper Mario game since Sticker Star gradually making the story less and less like the main series than the last. For example, Mario & Luigi Paper Jam may have had Peach captured, but it was all presented in a way far superior to Sticker Star. Both versions of Peach tried to escape the castle rather than staying put right till the final boss battle. The Koopa Troop was using Toads as slaves to mine ore in a dungeon under Twinsy Tropics, to find the fuel for the flying castle they’d later use. And heck, Bowser even kind of gets over his princess crush in that title! That’s pretty shocking if you ask me! 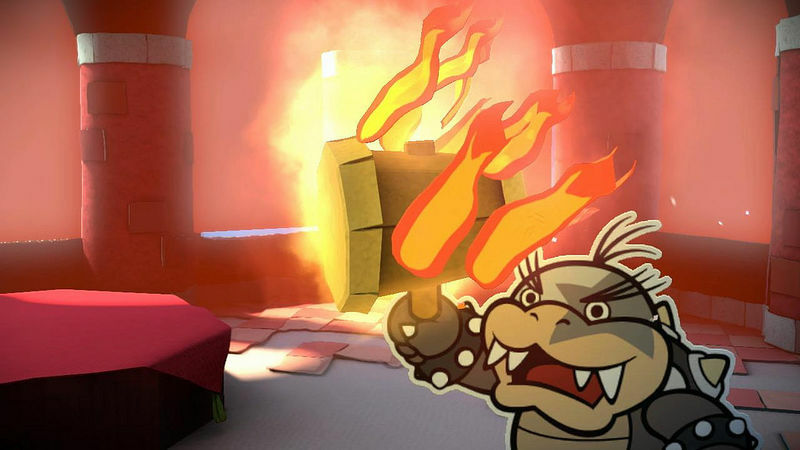 As is Bowser and his paper counterpart planning to burn the paper book (and hence Paper Mario universe) with the Mario bros and friends trapped inside. Again, not something you’d expect from Bowser, and possibly evidence the Paper Mario games are willing to try something new. Which brings us to Color Splash. What happens in this one? Well, Bowser not being evil, that’s what. He’s not really behind the events of the storyline. Yes, he’s shown in game as a villain and you do fight him. But in this title, he’s been possessed by the black paint from the fountain, and turned into a malevolent being of pure evil and destruction. You can actually see this in the battle, where he’s confused about why he’s fighting Mario to begin with. In other words, it’s basically a lot like what happens in Superstar Saga with ‘Bowletta’. Or Partners in Time with ‘Shrowser’. Except you know, the real villain doesn’t fight you as a separate entity. We have a new villain in all but gameplay. So the story is getting significantly better in each of these titles. Maybe not up to the standards of the original three games, but certainly more interesting than a standard princess kidnap plot like in the New Super Mario Bros games and Sticker Star. And with the characters and content getting better, the storyline improving and the character personalities getting deeper and more enjoyable, what’s left? Cause in Color Splash, the bosses seem to be gradually moving away from the ‘Thing needed to defeat puzzle boss’ concept. Think about it a minute. What’s the only notable thing that seems to improve over the course of the game? It’s the Koopaling fights. Because they get less and less Thing dependent as the adventure moves on. For instance, Morton (the first one you seem to face) is pretty clearly a puzzle boss through and through. His flaming hammer will obliterate you if you can’t counteract it, and putting it out makes him weak enough to be defeated easily. So that’s very similar to the Sticker Star fights. But then the others seem to get less boring. Iggy has the chariots he rides in, yet you only need the Bone Thing for the second half of the battle. The first one? Pretty much an entirely typical RPG style boss battle where you choose any attacks you like and attempt to block his attacks. And in turn, that continues until the last two or so Koopalings. These ones (Lemmy and Roy) are for to all extents and purposes, not puzzle bosses. They have gimmicks, but the Thing card is used at most once during the battle for a specific event and then never again. I mean, go back and look at the Roy Koopa fight shown in the livestream. Literally 95% of it comes before you need the Washer thing. Add how Bowser himself (from what I remember) doesn’t need any Things to beat, and it seems like the series is gradually improving the combat and moving away from puzzle based bosses in general. Yeah, it’s small steps, and it’s not as complex as in Thousand Year Door or the original. But it’s a damn marked improvement over Sticker Star’s boss difficulty brick walls. A sign that someone at Intelligent Systems does want a decent combat system and fun bosses in these games. So yeah, I think Paper Mario is indeed returning to its roots and getting more interesting. It’s slow and it’s happening bit by bit, but Paper Jam and Color Splash are miles ahead of Sticker Star in terms of quality none the less. Maybe Intelligent Systems and Nintendo are already starting to make Paper Mario great again. But what do you think? Is Paper Mario returning to the good old days, one small step at a time? Or do you think Color Splash is just more evidence of the franchise’s terminal decline? Either way, post your thoughts at the Gaming Reinvented forums or on social media today!